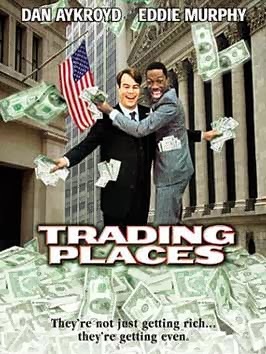 If you haven't seen it, Trading Places is a comedy directed by John Landis about two men, a white commodities broker (Dan Aykroyd) and a black conman (Eddie Murphy), whose lives are switched by a pair of rich businessmen in the service of a twisted bet. It's sometimes described as a take on the Prince and the Pauper, which is a bit of a stretch but not entirely inaccurate. It's not a bad movie, but it's nowhere near as good as Landis's previous two films (it was made right after Blues Brothers and An American Werewolf in London). Trading Places works better the less you think about it: there's some solid comedy here, largely thanks to the actors. The satire never builds to much of a message other than the obvious lip-service to racial inequality being cultural rather than genetic. I don't know if this was a controversial idea at the time (I certainly hope not, but I'd don't want to credit the decade which popularized trickle-down economics with an abundance of intelligence). Regardless, while the jokes hold up, the ideas don't pack much of a punch anymore. The events of the movie are centered around the holidays. One of the movie's better sequences focuses on Aykroyd's character having a mental breakdown, dressing as Santa Claus, and invading his old company's office Christmas party. This serves as a catalyst for Murphy's character learning the truth about his good fortune. The two team up on Christmas, which occurs about two-thirds of the way through the movie. At this point, the movie shifts from satire to all-out farce, as the characters put together an elaborate heist to beat the rich businessmen at their own game. All this plays out over New Years Eve. This is where the movie falls apart. The satire might not come off as deep, but the tone had kept the movie enjoyable. From here on out, it's just a jumbled mess of absurd actions and jokes being hurled at the audience. A solid fifteen minutes is devoted towards contriving a scenario where one of the movie's villains could be dressed in an ape suit, locked in a cage with an actual ape, then (presumably) raped repeatedly by the animal. Yeesh. The scene where Aykroyd shows up in blackface almost seems tasteful in comparison. I hate to dwell on this portion of the movie. It's unfortunate the worst was saved for last, because it's the part that winds up in the front of your mind. Most of the movie featured some clever jokes and solid comedic acting, not just from the two leads, but the entire cast: I wish it had wrapped up on a stronger note. The first two-thirds aren't perfect, but they are fun. Even the end has a few good moments, but it's hard not to be disappointed. Despite featuring Murphy and Aykroyd in their prime, I can't say this is highly recommended. However, it's a decent enough holiday comedy, if your standards are kept in check.